Figure F3. A. Massive hydrate from the summit of southern Hydrate Ridge. B. Porous hydrate from the summit of southern Hydrate Ridge (from Suess et al., 2001). C. Thin section of macroscopically massive hydrate showing porous structure (from Bohrmann et al., 1998). The thin section measures ~6 cm across. D. Acoustic "bubble" plumes from three sites on the Oregon margin (see Fig. F1B), recorded by a Seabeam 2000 12-kHz echo sounder. E. Phase diagram for methane hydrate in seawater. 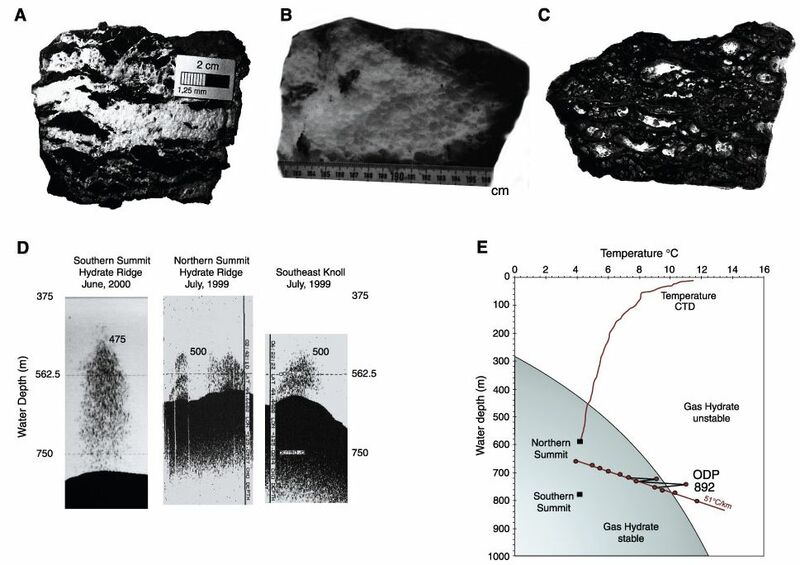 The depths of the northern and southern summits of Hydrate Ridge, the measured temperature gradient at Site 892, and the temperature-depth profile from a concentration/temperature/depth (CTD) cast on northern Hydrate Ridge are also shown. Hydrate should be stable at the seafloor and in the water column to a depth of ~450 m over Hydrate Ridge.